What Are the Latest Numbers for the SW Florida Market? | Leugers Group, Florida Real Estate Blog Leugers Group, Florida Real Estate Blog: What Are the Latest Numbers for the SW Florida Market? What Are the Latest Numbers for the SW Florida Market? Hey everyone, today I am here with your April market report. With so many people in the area thinking about buying or selling, I feel it's important for me to keep you updated on the market so you can make educated decisions in the marketplace. First off, existing home sales. Existing home sales are way up over last year. The yellow dotted line going across is where we were last year in February. And that red arrow—double arrow on the right‐hand side—shows the increase over last February. So even though you will see some headlines saying that sales are down compared to a few months ago, which is true, they’re still way above where they were this time last February. And if we look at pending home sales—the number of sales that actually went under contract—they’re surging right now. That gray dotted line across the screen is what NAR sees as a normal market. Anything over a hundred means we’re very, very healthy. And as you can see, over the last couple of months, we’re surging over that hundred mark. So, what are the mortgage rate projections? 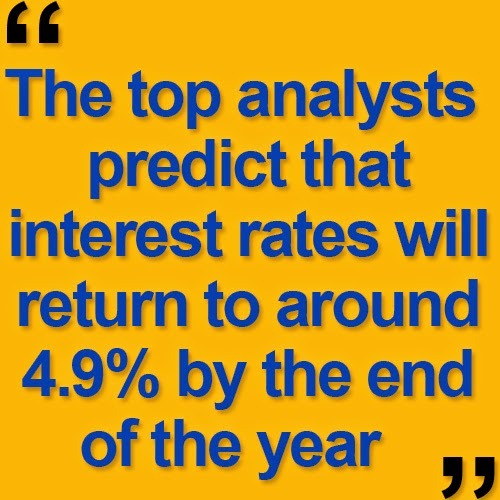 The top analysts predict that interest rates will return to around 4.9% by the end of the year. So looking at this graph you can see that if interest rates increase by 1%, the same $300K buyer can now only afford a home worth $270K, and if you couple that with the appreciation we’re getting down here in SW Florida, you can see that you would get much less of a home. There you have it, the numbers for April 2015. If you are thinking of buying or selling anytime in the near future, give me a call or send me an email. Also, if you'd like a copy of one of our two recent reports (How to sell your home for 18% more and the 7 most common buying mistakes), send us an email and we will get them right out to you, free of charge. Thanks for joining us today, we hope to hear from you soon!